Tuck Pointing, Brick and Chimney Repair Toronto | Turnbull Masonry Ltd > Blog > Blog > What Chimney Supplies Do Fireplace Owners Need? Are you a new chimney owner, or just looking to update your current stance on chimney tools? If you have a chimney it’s important that you keep up to date with routine cleaning and maintenance so that your chimney keeps you warm without causing a catastrophe, such as a house fire or toxic exposure. In order to keep your chimney looking and operating at peak efficiency, there are a few tools you should keep on hand at all times. Here we cover everything you need to know about appropriate chimney supplies you should keep handy. 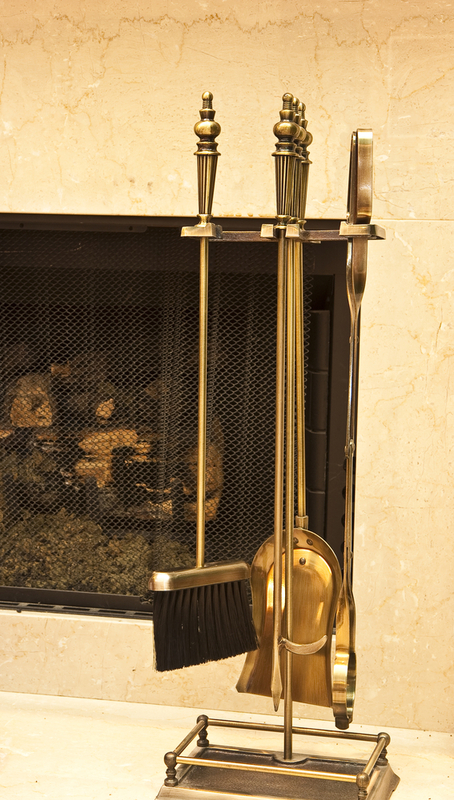 If you have a chimney the most important tools you can keep on hand, besides clean burning firewood, are cleaning supplies. Just like anything you own, if you keep your fireplace clean it is going to work better and last longer than an unkempt, dirty fireplace. If you plan to keep up with your own chimney maintenance you will need to keep a number of tools on hand. If you only plan to clean the firebox of your chimney you can purchase a set of tools that include everything you need on Amazon, or at your local home goods convenience store. These tools consist of a dustpan, shovel, and a pick. 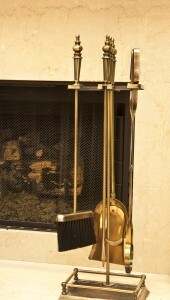 The pick can be used to redistribute logs when the fire is on, and the dustpan and shovel are used to clean up the mess left behind once a fire has sufficiently died out. Not only does the firebox of your chimney need to be thoroughly cleaned, but also so do the sides of your chimney walls, which build up with thick plumes of smoky toxins. Many people hire a professional to come out and clean their chimney. Chimney brush—these come in both wire and plastic models. Make sure to buy the right size according to the measurements of your chimney. Chimney brush extension pipes—you will need some sort of rope pulley system in order to reach all the way up (or down) your chimney walls. Stiff, small wire brush—this is used for deep cleaning small areas, as well as the damper which you will extract from the top of the chimney. Plastic tarp or cloth of some sort—you will drape this down in your home to cover carpets, floors, and other nearby things that could get damaged by falling fireplace debris as you clean. Goggles, and a dust mask of some sort—you can’t forget to protect yourself from toxins, ash and dust. A ladder to climb up to the top of your chimney. Fireplace Screen—Do You Really Need One? Many fireplaces come with a built in screen, while others do not. Do you really need a fireplace screen? This is a question we often hear, and the answer is yes, you really do need one. Fireplace screens are often used to make a design statement just as much as they are used for safety. Fireplace screens keep debris and embers inside of your firebox from blowing out into your home. If you are burning a fire and suddenly a downwards draft flows through your chimney, family members or pets could be injured, your home could catch fire, or everything near the fireplace might be covered in ash and debris. By simply keeping up a fireplace screen you prevent these unfortunate scenarios from occurring. Aside from the materials necessary to clean and maintain your chimney, your actual chimney structure requires a number of parts to properly work without endangering you or your property. When all parts are accurately working together your fireplace provides a warm and pleasant escape from the frigid weather outside. Here we identify a few key components your fireplace needs built inside in order to properly function without failure. You need a chimney liner to keep the heat and toxic smoke from damaging the outer structure of your chimney, as well as seeping into your home. The chimney cap is another important part of your chimney that assists with the ventilation process, as well as keeping out water, debris, and animals that would love to make a home out of your chimney. The flue is a pipe that runs throughout your fireplace and removes the exhaust gasses from the fireplace into the outdoors. Without previous experience inspecting chimneys you might be unsure if your chimney has all of its working parts in order. Having a professional out to inspect your chimney every year is a beneficial way to ensure the safety of any structure. For all your chimney maintenance, repairs, and rebuilds contact Turnbull Masonry today!